Winters spent in Lake Jackson, Texas, a small town 30 miles south of Galveston, are always green. I attributed this oddity to its Gulf Coast semi-tropical location. A drought this past summer, disabused me of this notion. Lawns, at least those not watered illegally in the middle of the night during mandated water rationing, were brown. A greenness, however, still abundantly sprinkled the landscape. Above the brown grass, mixed in with the winter barreness of pecan, ash and maple trees andguarding the landscape stand an abundance of southern live oaks, many dripping with moss. This is the same species of tree that gave the USS Constitution, America’s oldest commissioned ship, it’s nickname “Old Ironsides.” Cannonballs bounced off this ship’s live oak hull. In addition to their strength, live oaks join the pines in being ever green. A huge one of these trees dominates the backyard at my son’s house, and several keep the park across the street inviting during the cold days. I find these trees a comforting sight, as I suspect do the birds that nestle in its branches. 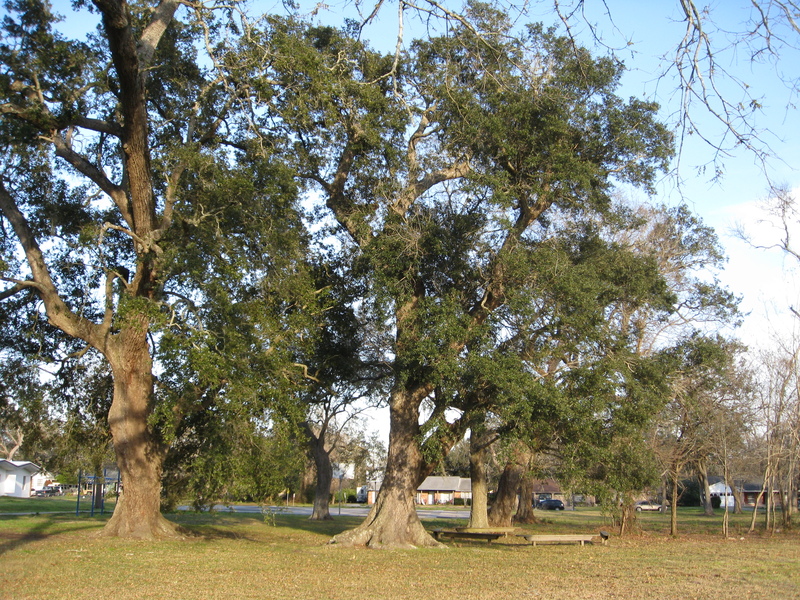 Live oaks live about 200 years, although a few 400-year-old specimens have been documented. They’re not neat, up and down straight trees. They come in twisted shapes, surviving whatever catastrophy nature throws their ways. Their trunks are often twisted, as are the winding branches that race to outstrip in width the height of the tree. Often they win. It’s not an easy tree to hug. I know. I’ve tried it. On my father’s home place in South Central Texas, there’s an old three-trunked liveoak, the most beautiful tree I’ve ever seen. When I was a teen, I would sit on the lower branches, the ones that nearly touched the ground. Fear of heights kept me from climbing. When the property was sold, I didn’t think about the land going; I thought about losing the tree. But I guess I still have it, don’t I? Thank you for reminding me. Thank you Kathy for commenting. It’s nice to have such a gracious reader. I actually hug trees occasionally. They seem to call to me.